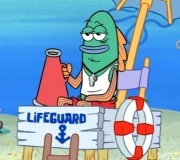 Lifeguard – From SpongePedia, the biggest SpongeBob-wiki in the world! The Lifeguard appears in many episodes that feature Goo Lagoon. He works with other lifeguards, like Larry. He has a great attittude and was only heard mad in the episode Ripped Pants. He is the only other lifeguard besides Larry. When someone isn't drowning, he sits in a tower that says "Lifeguard" on it. He has green skin and a white shirt. He also has all the gear he needs to save a drowning person and a whistle. "Oh, look, a cardboard box washed up on the beach". "You destroyed the lifeguard tower!" This page was last modified on 2 March 2013, at 17:04.